The OnePlus 6T is confirmed to feature an in-display fingerprint sensor. Similar to the Vivo phones, the 6T will highlight the area where the sensor lies when you pick up the device. The OnePlus 6T is one of the most hyped smartphones of this year, building up excitement amongst its fans as to what it will offer, given the OP6 has already proven to be a brilliant phone. Leaks have hinted towards a Vivo V11 Pro-esque mini-notched display and a fingerprint sensor. Well, OnePlus now confirms the presence of the in-display fingerprint sensor on the 6T. In an email conversation with CNET, OnePlus has confirmed that will be offering the in-display fingerprint sensor for the first time on their product. "We unlock our phones multiple times a day, and Screen Unlock reduces the number of steps to complete the action. By adding this feature as an addition to other display unlocking options such as Face Unlock, users will have options to unlock the display in a way that is most efficient for them,” wrote OnePlus. The in-display fingerprint sensor was originally planned with last year’s OnePlus 5T, which adopted the modern 18:9 aspect ratio. However, OnePlus says that at the time, the in-display sensor technology wasn’t good enough for OnePlus to consider it for their smartphone. It wasn’t even ready for the OnePlus 6’s launch window. Therefore, the 6T was chosen to debut the technology. In the report, OnePlus has said that the in-display fingerprint sensor has caused some changes in the design when compared to the OnePlus 6. The 6T has reportedly grown 0.45mm due to the optical sensor sitting under the display. Certain other components had to be rearranged as well. The rear panel will now only feature the camera module, although it’s not mentioned as to whether OnePlus will offer a triple camera setup. 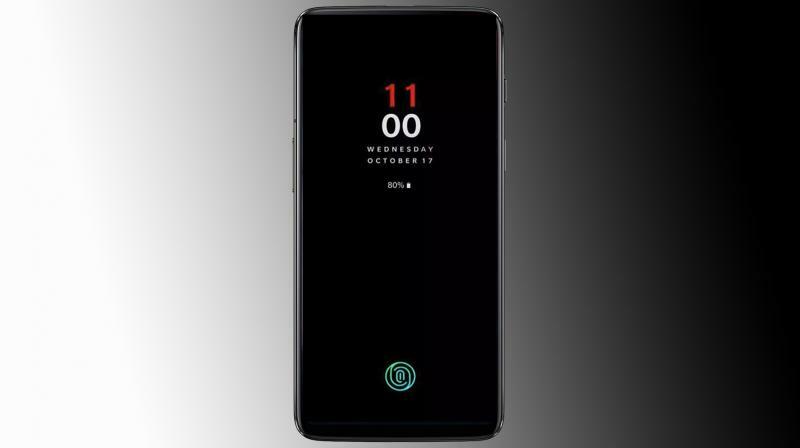 A screenshot shared with CNET shows the fingerprint sensor patch activated on the Glance Screen of the OnePlus 6T. Similar to the Vivo phones, the 6T will highlight the area where the sensor lies when you pick up the device. The date mentioned above also hints at a probable launch date of 17th October, which by OnePlus standards is pretty early, considering the 3T and 5T were launched in November.